TeachPitch Partners with Dedicated to Learning to support rollout of international 2 +1 High School Program. 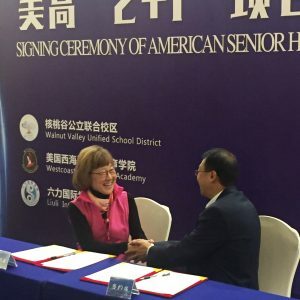 We are very happy to announce our partnership with the California-based education organisation Dedicated to Learning in the rollout of a Sino-American high school curriculum called ‘2+1’. The three-year-program will allow Chinese senior high school students to obtain a dual degree valid in both China and the US. The first school to officially participate in the 2+1 program is the Liuli International School in Wuqing. During their three years of education, students will have to follow a series of elaborate high-quality online courses, undergo a variety of international test and exams and complete their degree by physically attending a high school in a Southern California Public School District. TeachPitch is very proud that its TeachPitch for Schools software has been chosen as the online learning system to facilitate the continuous exchange between teachers and students from the US and China and to ensure that their degrees have a long-lasting, valid standing in both countries. We are very much looking forward to work with Dedicated to Learning and aligning public school districts, Liuli International School and their partner the West Coast Preparatory Academy to make this a big success for the thousands of students that will benefit from this program. It is really an honour that our technology can become part of realising such a genuine global connection, further building on educational ties between China and the US. Earlier TeachPitch partnerships realised in China are with the Australian International School in Beijing (AIDI) and the education company OneWorld through its GYAP Program. As always, please do not hesitate to contact us at info@teachpitch.com should you have any further questions or ideas. ← TeachPitch Partners with the Frostig Center to Enhance a Global Understanding on Special Needs Education.